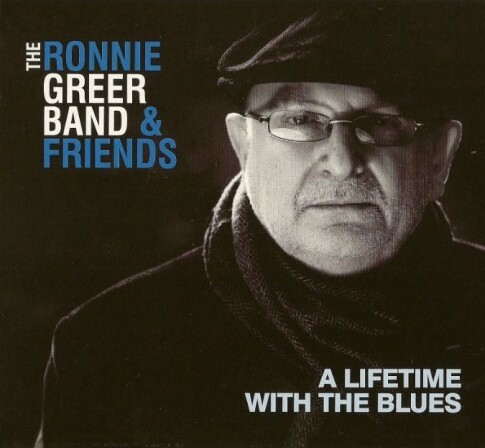 Belfast’s very own blues guitar guru, Ronnie Greer has just released a beautifully crafted album – A Lifetime with the Blues featuring some of the finest blues and jazz musicians in Northern Ireland. Amazingly, this is Ronnie’s first studio album and it features the music he loves including Chicago Blues, New Orleans-style jazz and Bebop. The album, which is available for order on his website starts off with a great, straight ahead Chicago Blues – That’s Alright – featuring his regular band, Ronnie himself on lead guitar and vocals, John McCullough on keyboards, Alan Hunter on bass and Colm Fitzpatrick on drums, Anthony Toner, a core member of the band, supplies slide guitar, vocals and acoustic guitar on a number of sides, including Robert Johnson’s ‘Walkin’ Blues’. Other tracks reflect Ronnie’s foray into the jazz world, with musicians such as Linley Hamilton on flugelhorn and trumpet and Dave Howell on tenor sax. His duet with Hamilton’s Old New Orleans, Satchmo-style trumpet on ‘Baby Won’t You Please Come Home’ is a joy. Two of Northern Ireland’s finest vocalists Grainne Duffy and Ken Haddock add their chops to ‘Never Make Your Move Too Soon’ and ‘Dangerous Mood’ respectively. Teatro Restaurant owner and troubadour, Kyron Bourke supplies the vocals and Wurlitzer on his own composition, ‘Jennifer’ – providing an early Tom Waits-style, late night barroom vibe. On ‘Roll ‘Em Pete’ John McCullough provides some great Barrelhouse piano, while Greer’s own original composition – ‘Going down to Clarksdale’ is a tribute to his musical heroes, the Mississippi bluesmen, such as Muddy Waters, Magic Sam and Otis Spann who left behind the oppression of their native state to start a new life creating the new fangled, Electric Blues in Chicago clubs such as Kingston Mines. The album includes great sleeve notes from respected Jazz and Blues writer Trevor Hodgett that sum up perfectly Ronnie’s magnificent career. An absolute delight of an album and a must have for local fans of the world’s greatest music – JazzN’Blues.